An innovative fix for a congestion-plagued interchange connecting people to some of Chicago’s most popular destinations and a bikeable/walkable greenway connecting neighborhoods (seen above) along Atlanta’s north side were the winning projects in the 2018 America’s Transportation Awards competition. The Illinois Department of Transportation’s $135 million Interstate 55 and Lake Shore Drive Interchange project earned the Grand Prize, while the Georgia Department of Transportation’s $9.3 million 400 Trail (PATH 400) project was voted the Socrata People’s Choice Award winner in the 11th annual competition – an awards program sponsored by the American Association of State Highway and Transportation Officials, AAA, the U.S. Chamber of Commerce, and Socrata, which is a part of Tyler Technologies. Illinois DOT’s Interstate 55 and Lake Shore Drive Interchange project increased safety, reduced congestion, and cut drive times. 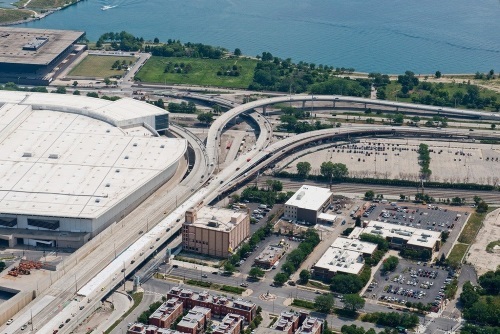 The new interchange now connects a major interstate and an urban expressway near some of Chicago’s most popular recreational and educational destinations. Several creative solutions were used during construction, such as building a temporary bridge to accommodate Interstate traffic in order to avoid closures and detours. Meanwhile, Georgia DOT’s 400 Trail project earned the highest number of online votes cast in the Socrata People’s Choice Award competition. The multi-modal pathway built on the right-of-way of GA 400, reclaiming what was previously a highway-only corridor. The pathway provides a critical connection within the community, bringing together 8,000 residents within a walking distance of 10 minutes. Overall, the 2018 competition attracted 79 project nominations from state departments of transportation in 35 states. Four regional competitions were held and the three projects from each region receiving the highest ratings competed for the final two awards. An independent panel of industry judges selected the Grand Prize winner, while the project receiving the highest number of online votes earned the Socrata People’s Choice Award. Presented at the AASHTO Annual Meeting in Atlanta on Sept. 23, the Grand Prize and Socrata People’s Choice awards each came with $10,000 cash prizes to be used to support a charity or transportation-related scholarship program.